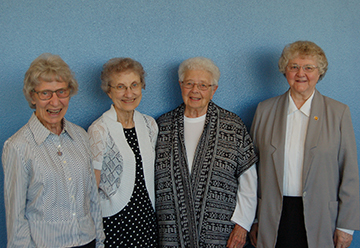 Congratulations to Sisters Renee Zastoupil, Susan Lardy and Denise Ressler on the 60th anniversary of their monastic profession and to Sister Madonna Wagendorf, who celebrates her 70th anniversary of monastic profession! These sisters will celebrate with the monastic community on July 11. Sister Madonna recently celebrated her 90th birthday and now her 70th anniversary of monastic profession. She has been in the medical profession for all of her years as a sister, beginning at Riverdale Hospital in North Dakota, which was near the site of the construction of the Garrison Dam. To meet a growing need, she became a certified nurse anesthetist, serving at St. Alexius Medical Center (now CHI St. Alexius Health), Richardton Hospital, and was instrumental in starting Garrison Memorial Hospital in 1952. Sister Madonna was one of two nurses at the hospital. She was a mainstay at Garrison for 35 years, serving as nurse, director of nurses, nurse anesthetist and administrator. After retiring from Garrison Hospital in 1995, she became administrative assistant at Annunciation Monastery until she moved back to Garrison in 2002 and worked in spiritual care and medical records. Upon moving “home” to Annunciation Monastery, she assisted with the healthcare needs of the sisters. Currently, she can be found most often helping in the monastery kitchen.